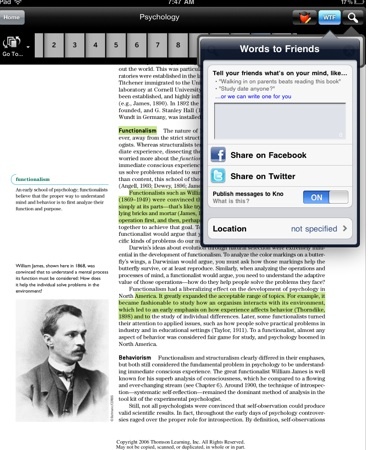 Last night, Kno quietly released its first digital textbook app for the iPad. It includes its own store of “over 70,000 titles at 30% to 50% off list” price. 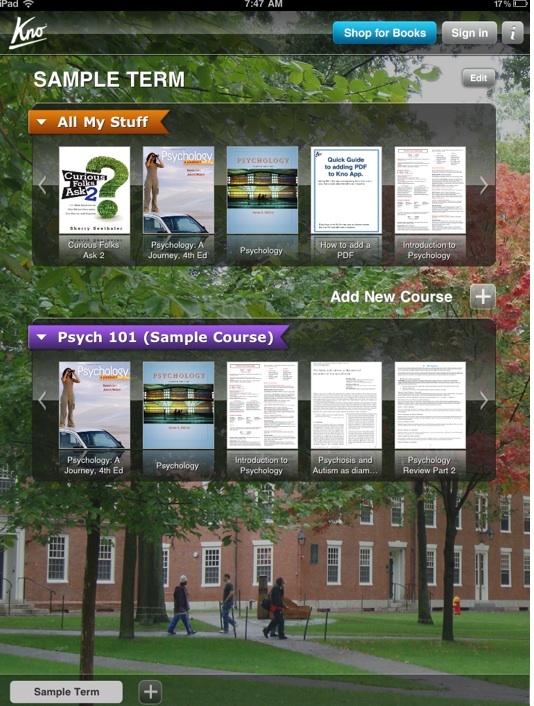 And the app is a full textbook reader. Kno, whose CEO Osman Rashid previously founded textbook-rental service Chegg, originally developed its own oversized tablet for textbooks. But once the iPad and Android tablets hit the market, the company saw the writing on the touchscreen and bailed on its hardware efforts last April. At that time, when I spoke to Rashid, he was talking down the iPad because it does not support a stylus, which is the input method the Know software was designed for (although there are styluses that do work with the iPad). Maybe he was just trying to throw me off the trail. The iPad app allows you to organize your digital textbooks and PDFs by dragging and dropping them into “courses.” Once you open a textbook, you can swipe through the pages or navigate via a filmstrip of thumbnails up top. There is also full text search. Pages can be bookmarked and highlighted. You can also add digital sticky notes which pop out from the margins. The highlight feature is a nice touch. You can also launch a Web or Wikipedia search based on a highlighted word. There is also a “WTF” feature, which stands for “Words to Friends,” although it could mean the more common acronym since it’s a nit of a head-scratcher. It allows you to send out little study messages to friends on Facebook or Twitter, but doesn’t link back to the text or even make it easy to cut and paste a quote. WTF, indeed. 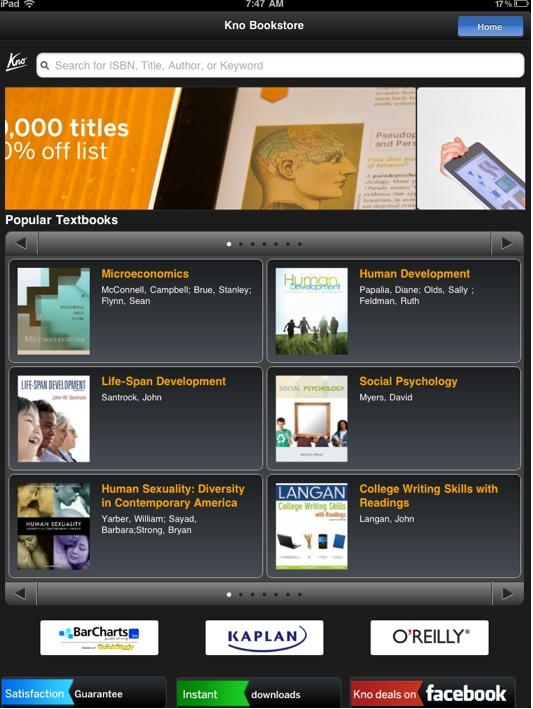 All in all, though, the Kno textbook app is pretty solid and will compete based on the breadth of its textbook selection and pricing. It certainly beats lugging around a backpack full of books.